Model and compare fractions using area models. Set the denominators with the arrow buttons, and then set the numerators with the arrow buttons or by clicking in the models. 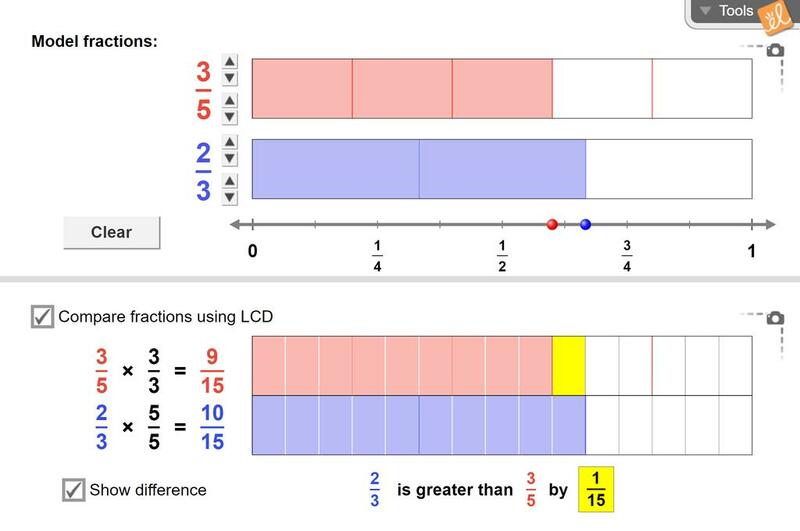 Compare fractions visually, on a number line, or numerically using the least common denominator. Understand the meaning of the numerator and denominator of a fraction. Increase or decrease the numerator. Increase or decrease the denominator. Create fractions that are equivalent to a given fraction. Find the least common denominator (LCD) of a pair of fractions. Compare fractions, both visually and numerically, using the LCD. Find the difference between two fractions. State of Florida - MAFS Florida Standards Assessment - Gizmo Resource for Grade 4. Contains sample questi... (more)on stems, various response mechanism types, and Gizmo suggestions for teacher and student use.